Are you interested in purchasing an existing business? There's a loan for that. 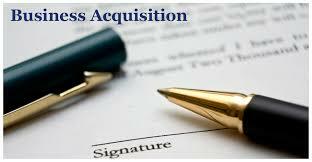 Read here to learn more about getting a business acquisition loan. Business acquisition loans are on the rise. In fact, so is the number of businesses that are being both bought and sold! If you're ready to take the step of buying an existing business, you may not have all the funds you need to do so when the time is right. Instead of letting a once-in-a-lifetime chance pass you buy, you can take out a business acquisition loan. In general, there are 4 main types of business acquisition loans. Let's take a look at them now. These are loans that offer monthly payments with fixed interest rate. These are the most popular type of acquisition loan. As a result, lenders can be choosy. You may need to file multiple applications before an acceptance. The Small Business Administration (SBA) doesn't just lend money to investors, despite what the name implies. Instead, the loans lenders offer to those wanting to buy businesses are guaranteed either in part of the whole by the SBA. That way, the lender takes on less risk. You can take out a loan of up to $5 million. If you don't have much experience with buying businesses, this is a great option. However, be prepared to have your own finances seriously looked at, and to put down a large down payment. Sometimes, the equipment an existing business owns can be just as valuable as the business itself. This lets you take out loans based on the equipment you'll own once you buy the business. When you're applying for a business acquisition loan, you need to be ready to explain to the lender why you're qualified to own and run this business. You'll also need to prove to your lender that your past work experience has given you the skill set needed to succeed at your new venture. You'll also likely need to draw up a potential business plan to share with your lenders. This plan should also include your projections for the growth of the company - with hard data to back you up. Be sure to discuss the specific new value you will bring to the business. How will you take it to another level? Finally, you'll need to complete your loan application, and provide any and all personal financial records the lender requires. Ready To Apply For A Business Acquisition Loan? Thanks to this post, you're ready to think more seriously about the type of loan that's right for you. You can also begin putting together the documentation that you'll need in order to apply. Looking for additional loan advice? Have questions that you need to be clarified? Want to become more financially solvent? Get in touch with us today to learn how we can help you.